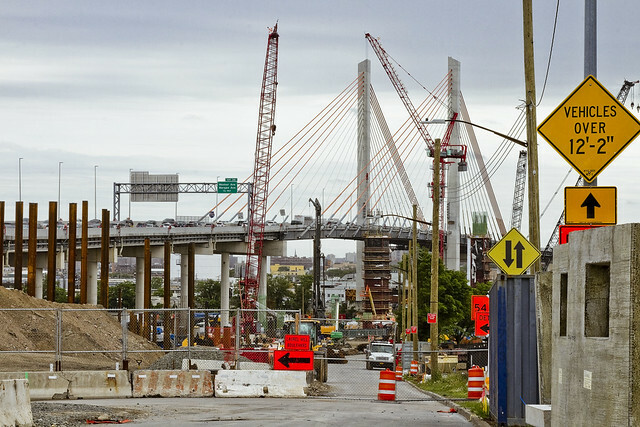 Kosciuszcko Bridge project in today’s post. A couple of weekends ago, I decided to take the camera out for a walk and we headed on over to the Queens side of DUKBO – Down Under the Kosciuszcko Bridge Onramp. 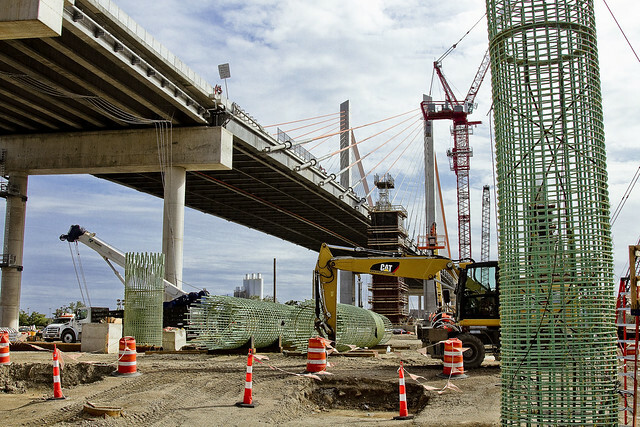 Most of what’s going on at the work site right now, which will result in the second half of the new bridge, seems to involve foundation and structural work. Laurel Hill Blvd. is largely closed to traffic due to the construction, as you’d imagine. The shot above looks south along Laurel Hill Blvd. towards Brooklyn. 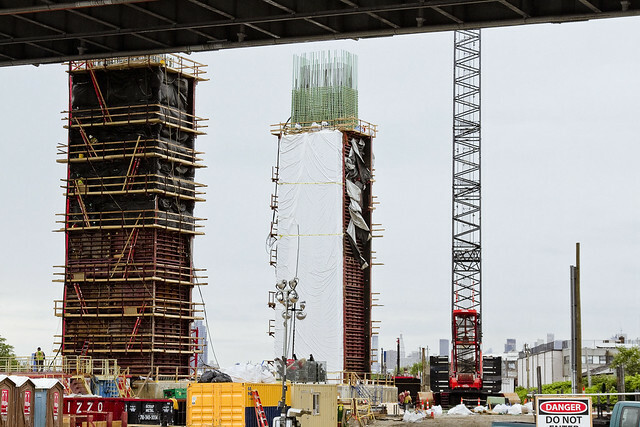 The steel piles above are the firmament which will carry the approach ramp for the bridge, which in turn carries the Brooklyn Queens Expressway. These will be the southbound lanes, which are also meant to host the bicycle and pedestrian lane that I – for one – am pretty excited about. I’ve seen renderings of the planned bike and pedestrian section and it promises to be a photographer’s dream come true. Most recently, in late September of 2017, a final series of shots of the old bridge were captured in this post. Acquisition of a souvenir chunk of steel from the 1939 bridge was described in this post, and a video of the “energetic felling” of the approaches on October 1st was offered in this one. 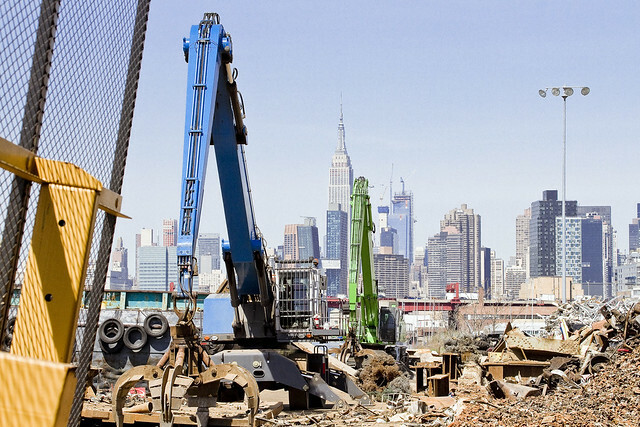 Still shots and views of the aftermath from the waters of Newtown Creek from later in the day on Oct. 1 are found in this posting, and the aftermath of the demolition as seen from Calvary Cemetery in LIC’s Blissville section in this post from October 5th. This post from December of 2017 closed out an event filled year in DUKBO, and a visit to the site at night is described in this March of 2018 post. That’s the first section of the new bridge, which opened last year, and as seen from 43rd street in industrial Maspeth. The NYS DOT has committed to making the currently dirt and equipment filled lots along 43rd street available to the NYC Parks Dept. for conversion to public “green space.” There’s other spots around the project which will turned into publicly accessible areas, but most will be shadowed by the onramps. 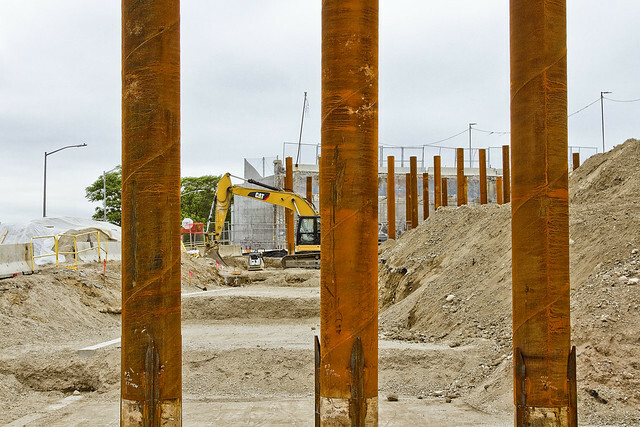 One scuttled across the Lower Montauk tracks of the Long Island Railroad to get a better view of the progress at the construction site. The land in this spot used to be the home of a company called Phelps Dodge, which acquired it from the original tenant – General Chemical. General Chemical manufactured sulphuric acid hereabouts, and Phelps Dodge incorporated the GC campus into their operations, which was mainly copper refining. This section of the LIRR tracks used to be known as “Deadman’s curve” for all the factory workers who were struck by speeding locomotives hereabouts. It’s also the site of the Berlinville Railroad disaster, where two LIRR trains collided in 1893. Check out this contemporaneous NY Times piece for more on that. 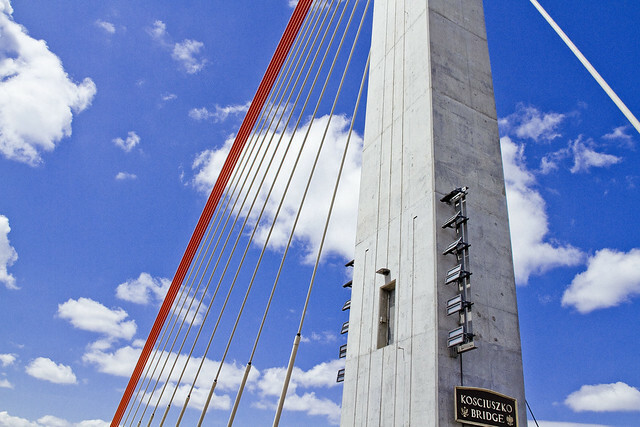 After having crossed the tracks and a byway formerly known as “Creek Street“ the still forming concrete towers which will support the “cable stay” roadway of the second bridge came into view. 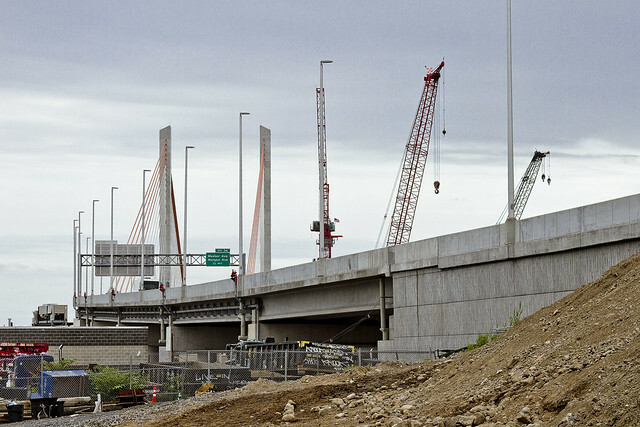 Having followed the project so closely as the first half of the new K-Bridge went up, it’s actually pretty interesting to watch them working on it this time around, given that I know how the story plays out. 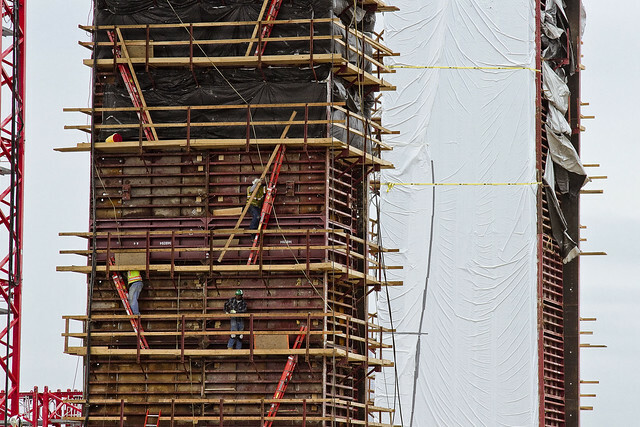 The shot above, depicting the teeny tiny construction workers moving around on ladders, is included for scale. Down on the ground, these guys are HUGE, six + footers who weigh a couple of hundred pounds each and who tower over a humble narrator. On the K-Bridge site, they look like action figures. I continued along my southern path and headed down to the bulkheads of that lugubrious cataract of urban neglect known as the Newtown Creek. 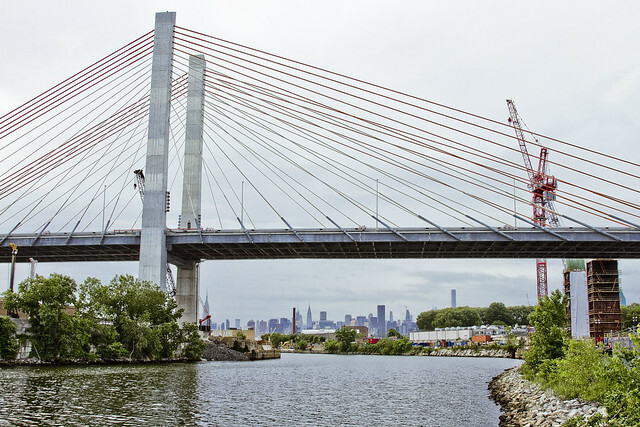 The Kosciuszcko Bridge is found 2.1 miles from the East River, and overflies the Newtown Creek. It carries the Brooklyn Queens Expressway from the border of Sunnyside/Blissville/Maspth in Queens to Greenpoint/Bushwick/Williamsburg in Brooklyn. Newtown Creek itself is an inland tributary of the East River, and extends 3.8 miles eastward of the larger waterway. There are multiple tributaries of Newtown Creek itself which extend into Long Island City, Bushwick, and Maspeth. Having satisfied myself with a “check in” on the bridge project, one began his trek towards home and HQ in Astoria. Sometime during this week, I plan on heading over to Greenpoint to see what’s doing with the K-Bridge project over there. I’ll let y’all know what I find. Whenever I mention the 1980’s to those who grew up in Long Island City and Astoria, a shudder seems to go through them. I’ve always wondered if that shudder has anything to do with why all the trees are in cages. I’ve asked a few of the lifers, but boiling down the answers offered by them reveals one singular truth, which is simply expressed by describing the Croatian people as being remarkably tight lipped. There’s some gesturing involved in their answers, and sometimes a few words in a language which I can never understand (I’ve tried). Regardless, something motivated several of them to build iron cages for the street trees around here. I’ve learned to just accept things over the years which I’ve dwelt here in Astoria, Queens. One is in a weird place, in terms of his mood. Feeling increasingly obsequious, and often wondering who the old fellow staring back at me from the bathroom mirror is, a humble narrator nevertheless sallies forth. 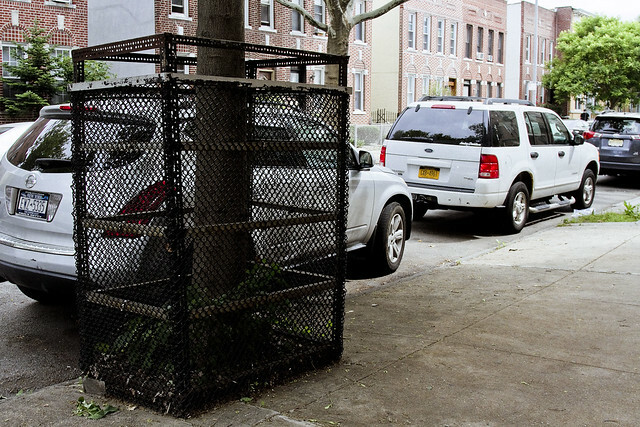 Like the trees here in Astoria, there are iron bars and fences all around me. Often it feels as if one is juggling chain saws, and that one slip up will result in disaster. The whole “angry young man” thing is no longer a valid posture, as I’ve instead found myself cast as a broken old man. Such is the wheel of life, however, and there’s no point in moaning about it. There are still battles to fight, and wars to win. Speaking of, that’s the Sunnyside Yards (est. 1909) pictured above. 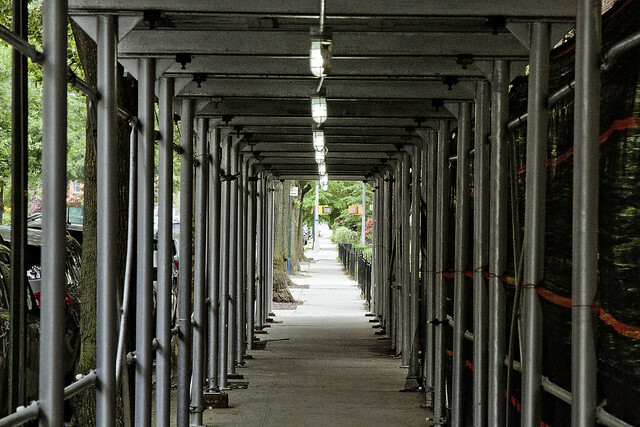 The shots in today’s post, from this point onward, were all captured along 43rd street while walking south. 43rd street, once you cross Northern Blvd. from the blessed rolling hills of almond eyed Astoria, used to be called Laurel Hill Blvd. 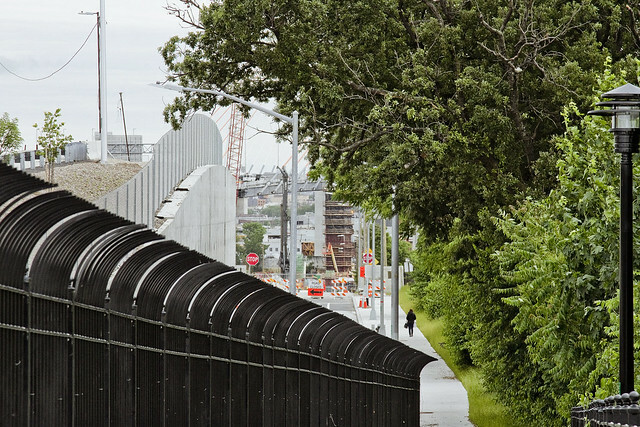 It connected the eastern side of LIC’s Blissville over by Newtown Creek and Calvary Cemetery with Middleburgh, which modernity calls Sunnyside. That was before the Long Island Expressway and the Brooklyn Queens Expressway, and even before Queens Blvd. and the IRT Flushing Line were created in the 20th century. 43rd street, as a pathway to Newtown Creek, has been off my radar for the last few years due to the Koscisuzcko Bridge construction project. 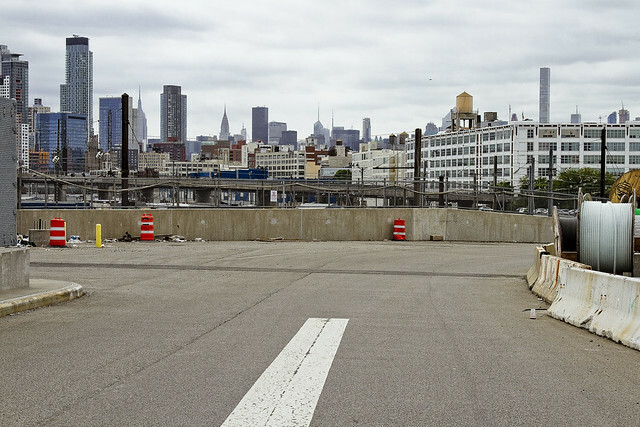 Just this last winter, the newly rebuilt pedestrian bridge spanning the onramp to the BQE from the LIE was opened. It replaced an older iteration as part of the bridge project, and I’m in the process of reinstalling this pathway as part of my mental map for “where do I want to go today” usage. The scaffolding in the shot above obscures the Celtic Park apartment complex, so named for a former beer garden and complex of athletic fields which the development is named for. The Celtic Park, as it was known, was designed and situated to take advantage of the huge numbers of Irish Catholic New Yorkers who came to Queens to visit loved ones in the various properties maintained by Calvary Cemetery found nearby in Blissville and Woodside. 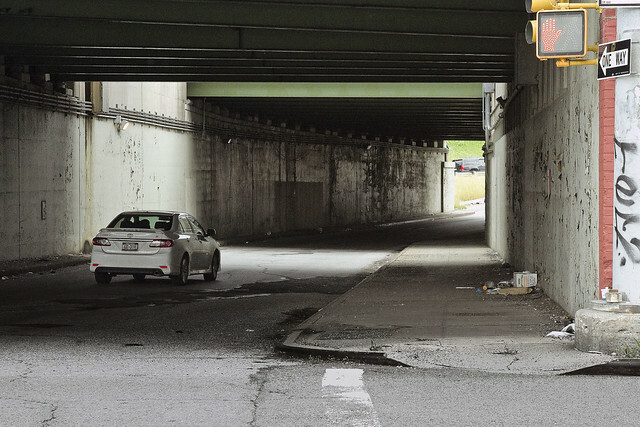 One improvement which hasn’t occurred, and I plan on getting after the K-Bridge team about it next time I see them, is the approach to the pedestrian and bicycle bridge that joins 43rd street with the stubby three block stretch of Laurel Hill Blvd. found on the south side of the LIE. 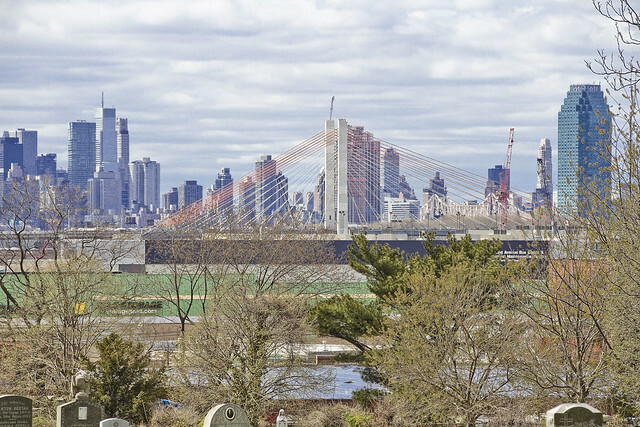 The trestle seen above carries the Long Island Expressway, and acts as a seldom mentioned approach to the BQE and Koscisuzcko Bridge itself. It’s fairly terrifying walking along this stretch of sidewalk, with traffic ramping up to highway speeds alongside of you. 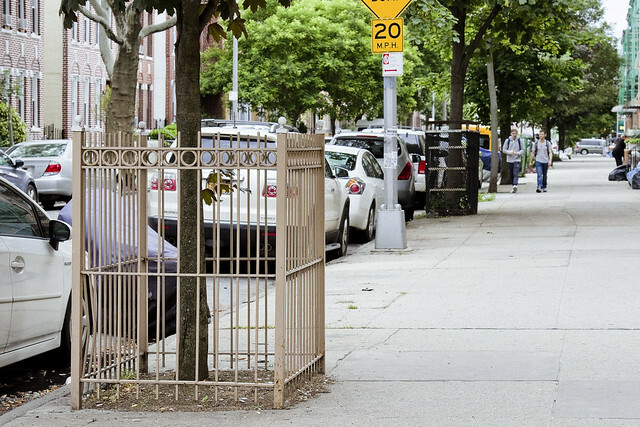 A series of jersey barriers would cheaply and effectively address the issue. I’m on it, don’t worry. Aforementioned, that’s the extant section of Laurel Hill Blvd. mentioned above. 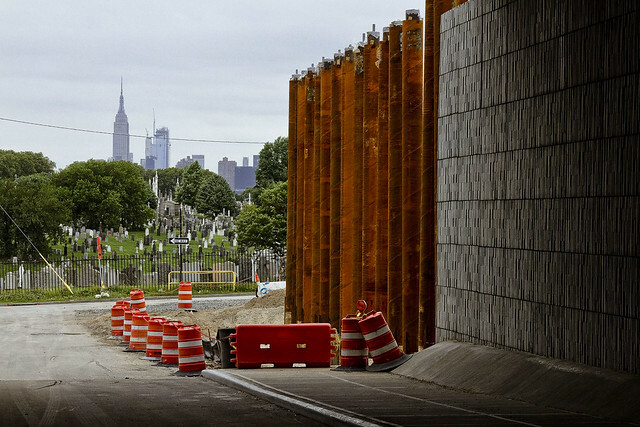 To the west (or right) is Blissville’s Calvary Cemetery, to the east (or left) is the BQE and industrial Maspeth. This is also more or less the legal border which once existed between the independent municipalities of Long Island City and Newtown, prior to the consolidation of the City of Greater New York. 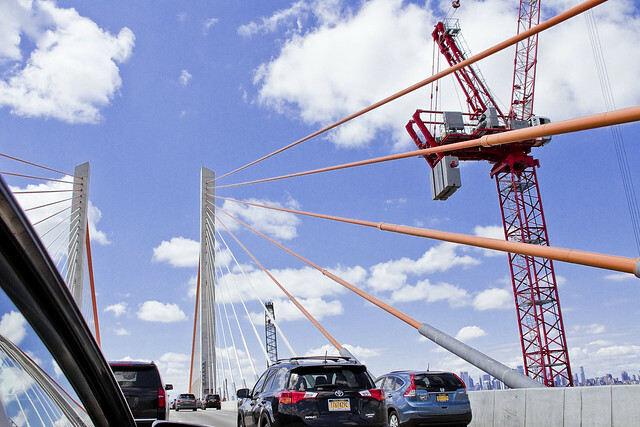 Tomorrow – so, what’s going on with the Kosciuszcko Bridge project? A sudden explosion of cast off gloves, observed, makes one wonder if the Queens Cobbler has been joined by a new fiend whom I’ve been referring to as the “Queens Gaunter.” The name “Gaunter” is derived from a fairly archaic English, incidentally, and it’s from the same root of the word which “Gauntlet” comes from. In the Industrial Age, the name of the profession became the rather plain “glove maker” in the case of male oriented hand coverings, whereas lady gloves were prepared by milliners. 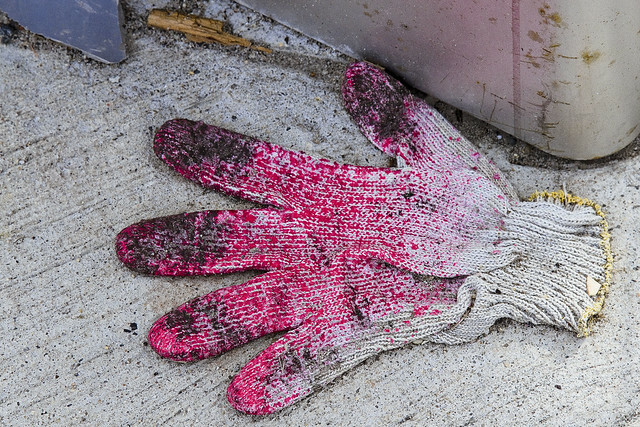 That’s a work glove pictured above, which is unisex, and it was found in Maspeth. Perhaps the “Maspeth Milliner” rather than “Queens Gaunter,” with the latter having a bit more of a salubrious “roll off the tongue” should be used for this recently discovered companion to the Queens Cobbler? You can record your preferences in the comments, Queensicans. One doubts that this red handed glove is in anyway related to the Ulster based “Red Hand Commandos” of West Belfast, incidentally, but you never know. Down at my beloved Newtown Creek the other day, one grew fascinated by these derelict piles along the former Phelps Dodge property’s waterfront. One whipped out the tripod, lowered the camera’s ISO and narrowed the lens’s aperture to its absolute in pursuance of “slowing the shot down.” This is the exact moment when I decided that I have to buy an ND filter next time I’m at “beards and hats” over in the city, incidentally. I really, really wanted to turn the water into a milky smear with perfectly glassine reflectivity here. 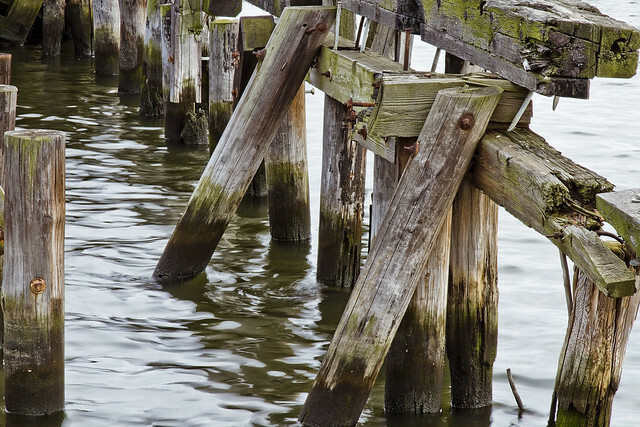 These piles supported a heavy pier which had rail tracks on it, once. Most of the property which Phelps Dodge used to operate on is fill. There’s a congressional act, whose name escapes me at this writing, which allows for corporate entities to buy underwater property along industrial waterways like Newtown Creek as long as they “improve” it by filling it in. This process was usually accomplished by building heavy timber box frames that were then submerged and loaded up with whatever material the industrial concern wished to use. In the case of Phelps, it was industrial slag from their copper refining operation mixed with rock and soil. 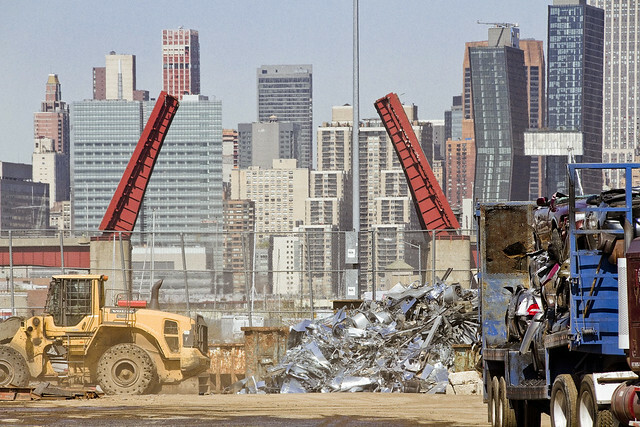 Industrial Maspeth, which one has repeatedly described as being his “happy place,” seldom disappoints the wandering mendicant and itinerant shutterbug. 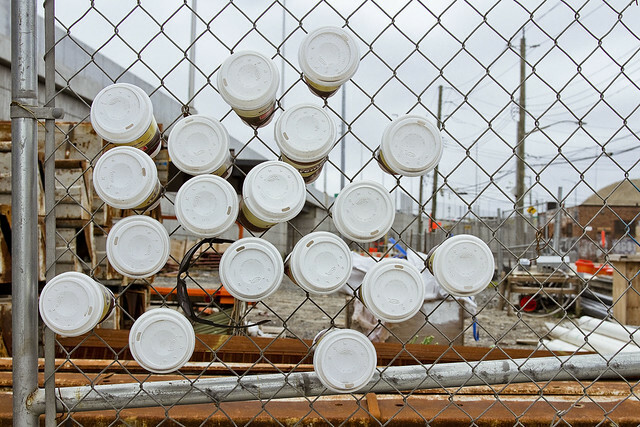 Encountered at the Kosciuszcko Bridge construction site, this array of spent coffee cups embedded in the chain link of a hurricane fence entranced me. Next week, I’ll update y’all on the progress that the NYS DOT is making on phase 2 of the bridge project, so there’s something to live for. Why does everybody keep on asking me how to dispose of a human body? It’s one of those questions that seems to come up in connection with Newtown Creek, for some reason, and random folks will jokingly ask a humble narrator about it at least once a week. On Tuesday, which was spent first at the Waterfront Alliance Conference on a boat in Manhattan (I was asked twice) and then speaking about the BQX project at Hunters Point Civic Association (asked once) one had to offer the same answer three times. A) The Waste Transfer people (garbage or recycling) would definitely notice it and call the cops as modern day environmental laws demand strict governance of what’s in the garbage they handle, B) if you stuck a corpse in the waters of Newtown Creek it would just stay there and be discovered – which would also result in the cops getting involved at which point “the jig is up.” In fact, not just its tributary waterways but the entire East River is a terrible choice for this sort of thing. If you threw a volleyball into the East River at Hunters Point, you’d be able to see it get pulled back and forth by the tide for days, transiting between the Williamsburg Bridge and Roosevelt Island. Eventually, it would get pulled towards Hell Gate, where it end up snagging onto the shoreline somewhere in either northern Queens or the Southern Bronx. Hudson River or Jamaica Bay, that’s the ticket for human remains. Back in the old neighborhood in Brooklyn, there were several members of a well known and self organizing fraternity of Italian gentlemen present who occasionally had the need to dispose of former associates. Infamous, there was a “crew” run by a guy named Roy which operated out of a bar called the Gemini Lounge on Flatbush Avenue (just off Kings Highway) and handled such matters for a certain high ranking fellow named John that lived in Howard Beach and conducted his business at the Ravenite Social Club in Manhattan. This crew’s specific line of work involved automobile theft, but they were also – allegedly – tasked with enforcing organizational discipline for the citywide organization. Their methodology, as described in court documents, involved the usage of power tools in pursuance of dismemberment. 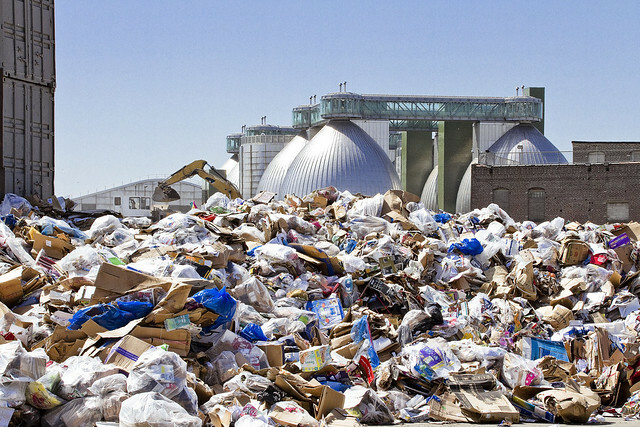 The “pieces” were then packaged into discrete paper bags and tossed out automobile windows on the east bound Belt Parkway, or hidden in the flow of residential garbage headed to the Fountain Avenue landfill, with the idea that either the crabs would take care of the evidence for them or that the parts would be hidden in the tonnages of trash poured into pits. I can tell you that back in the 1980’s, it was not an entirely uncommon thing for “parts” to be found abandoned in the shoreline sand lots found between Fountain and Emmon Avenues in this stretch of Brooklyn. I used to ride my Apollo 3 speed bike around in this area, after school, and can report that Jamaica Bay seems to have been a choice spot for all sorts of disposal activities. Of course, this is the era when medical waste such as used hypodermic needles still regularly washed up in the tide, so “organics” were the least of your worries. The Hudson River is the aqueous equivalent of an express train, with a fearsome current that roars towards the narrows and open ocean. Nefarious types I’ve known over the years have always indicated that their choice of “spots” for intact waterborne disposals involved a nocturnal trip to the south eastern shore of Staten Island. This is all hearsay, of course, as a humble narrator has always been too much of a “wuss” to ever involve himself with such affairs. Additionally, coming from a neighborhood which was renowned for both the benefits and negatives of the presence of these self organizing fraternities of Italian Gentlemen, the best advice I can offer to anyone is to walk out of the room when they start discussing such matters. You can’t “unknow” something, and once you’ve heard it you’re a potential witness against the speaker and could very well end up being eaten by the crabs in Jamaica Bay. The Newtown Creek is where amateurs like serial killer Joel Rifkin would attempt to dispose of a body, making the job of the NYPD an easy one. Three times on Tuesday, I had to repeat the screed above. Three times. Always late, always going somewhere, but never welcome. A couple of weekends ago, I helped out on conducting a tour for the Newtown Historical Society, but to my chagrin discovered that the MTA had negated any chance of me getting to the meetup location in Williamsburg via mass transit, due to track work and I had to use a taxi to get to the location. I would have walked, of course, but like the rabbit from Alice in Wonderland – I was running late. One does not spend much time in automobiles, so when I do, the window is open and the camera is getting waved about. 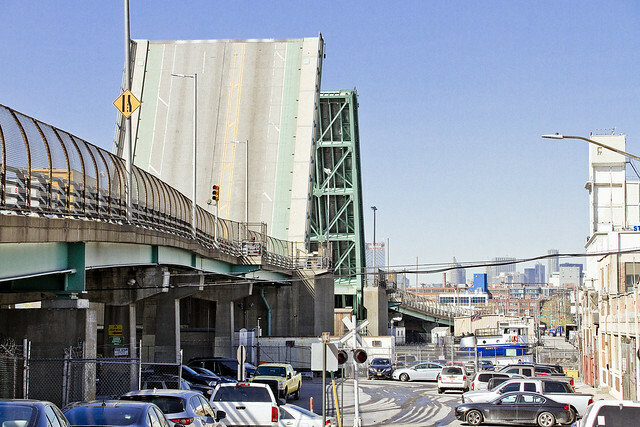 The driver opted to throw the dice on the route and chance the BQE, which crosses my beloved Newtown Creek via the Kosciuszko Bridge, as pictured above. The shot above is from Ridgewood, specifically from within Linden Hill Cemetery. For some reason, probably since I spend all of my time on the elluvial flood plains surrounding Newtown Creek and the East River, a humble narrator is fascinated by the altered perspectives offered by even minor changes in altitude. Are those drums I hear? Western Queens is under assault by the powers that be in Manhattan. Blissville gets a homeless shelter population which outnumbers actual residents by more than two to one? Check. The LIC Core rezoning is on the way, which will extend the residential towers of Hunters Point and Queens Plaza all the way up Northern Blvd. to Steinway Street? Check. 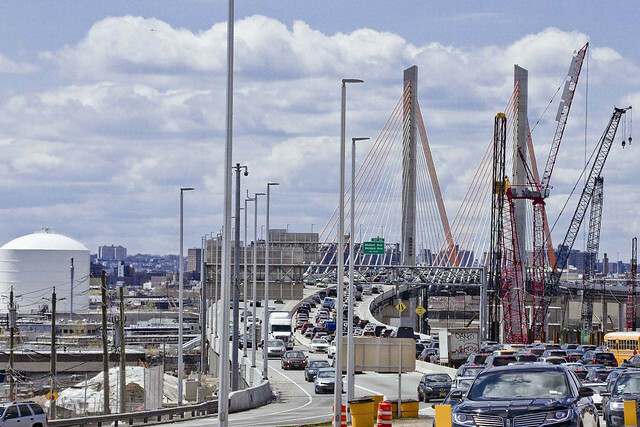 Traffic on the highways – namely the Brooklyn Queens Expressway, Long Island Expressway, Grand Central Parkway – higher than ever? Check. Did anyone in Queens ever ask for any of this, or is it just the dream of people who work in Lower Manhattan office buildings and at Columbia University? Do we receive literal mountains of garbage and recyclables curbside collected by DSNY on a daily basis? Check. Do the truck fleets of both DSNY and private carters transverse our residential neighborhoods on a daily basis? Check. Do we host power plants, and sewage plants, and waste transfer stations? Check. Is our transit system failing? Check. 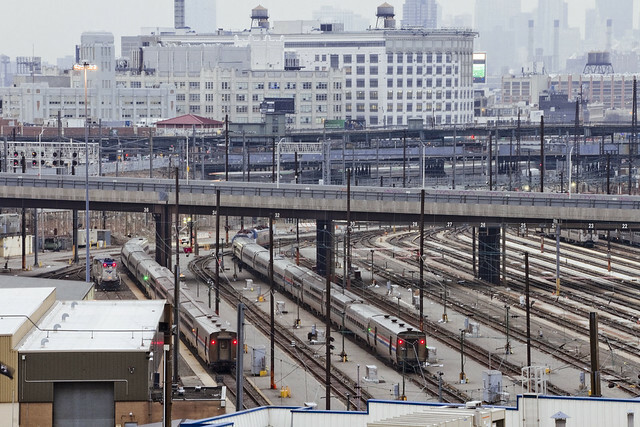 Did the Manhattan people export Fed Ex Ground and other truck based businesses to Western Queens the last time they decided to deck over a rail yard at Hudson Yards in the City? 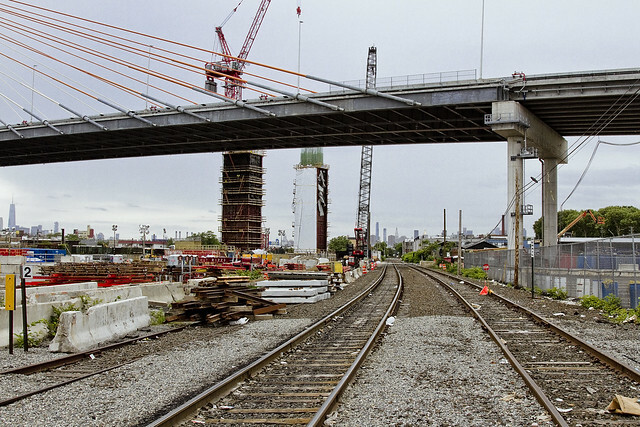 The NYC EDC is moving forward with their quixotic plan to deck over the Sunnyside Yards, lords and ladies. EDC has told me in the past that bringing construction materials in by rail is not an option, to a rail yard, which means it will be trucked in. Is that through Manhattan via George Washington and then Triborough Bridges? Midtown Tunnel? They do not intend on building new hospital beds, nor expanding fire and police service, or new transit stops and lines while installing half the population of Boulder, Colorado into our neighborhoods. Have I mentioned that Sunnyside Yards has been added to the list of “PRP’s” or Potentially Responsible Parties in the Newtown Creek Superfund? Check. Down with the night, yo. As opined yesterday, the wrought iron fence posts of First Calvary Cemetery are just the right size to stick a camera lens through. 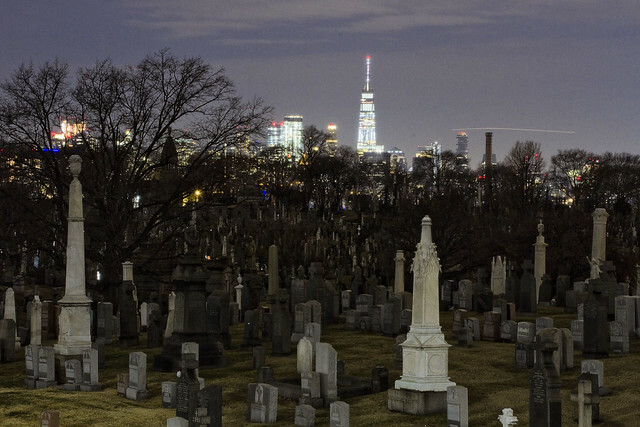 In that prior post wherein my keen observational prowess was offered, focus was given to the estimable Kosciuszcko Bridge project, while today’s set of images are a few night shots of the cemetery itself. Unless you are an absolute fanatical maniac on the subject of eating carrots or half Kryptonian, these shots are just a smidge broader than the perceptual range of human vision. The light sources are environmental, incidentally. 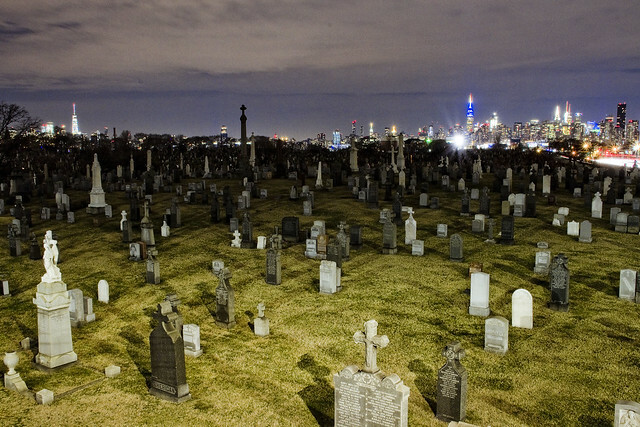 All I saw, with the naked eye as it were, was a silhouette of the cemetery against the skyline of the Shining City to the west. 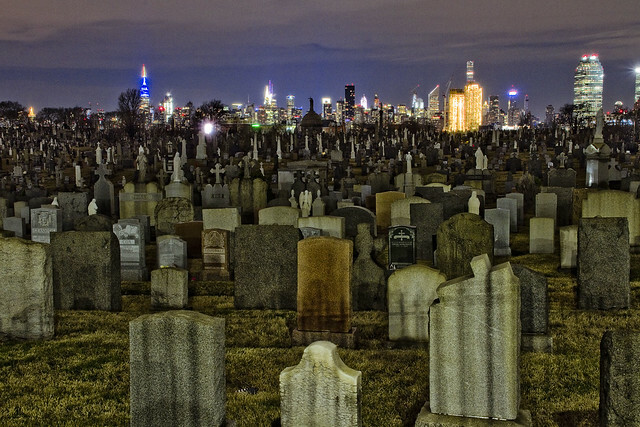 You can’t put a landscape picture of Calvary Cemetery up on the web without some recognizable part of the skyline in it, as a note. On Laurel Hill Blvd., here at the angle between Industrial Maspeth and Blissville, however – if you “go wide” the section of Manhattan between the Battery and 57th street can all be captured in one shot.